IS YOUR WORLD FLAT OR FAT? Most who frequent this blog are probably wondering why I would spend any time on this subject. Doesn’t everyone know that the Earth is an oblate spheroid spinning in space and revolving around the sun? No, apparently everyone does not know this. The main reason that I decided to discuss the Flat Earth Hypothesis here is because I like to encourage people to think for themselves, to use the intelligence God (or the Universe, depending upon the semantics you like to use to refer to Reality) has given them. And, yes, I said the ‘Flat Earth Hypothesis’. It actually is a scientific hypothesis because in can be proved or disproved by observation, measurement and mathematical logic. It actually meets the criteria for a legitimate scientific hypothesis. So let’s start with a little historical background. The flat Earth hypotheses originated in modern times with the English writer Samuel Rowbotham (1816–1884). Rowbotham published a 16-page pamphlet, Zetetic Astronomy, which he later expanded into a 430-page book, Earth Not a Globe, in which he described the Earth as a round, flat disc with the North Pole as its center. He claimed that the disc was bounded by a wall of ice, known as Antarctica, with the Sun and Moon only 3,000 miles above the Earth and the stars 3,100 miles above Earth. He also declared that the "Bible, alongside our senses, supported the idea that the Earth was flat and immovable and this essential truth should not be set aside for a system based solely on human conjecture”. Rowbotham created a Zetetic Society in England and New York, publishing over a thousand copies of Zetetic Astronomy. After Rowbotham's death, one of his followers, Lady Elizabeth Blount, established a Universal Zetetic Society. The society published a magazine, The Earth Not a Globe Review, and remained active until around 1910. A flat Earth journal, Earth: a Monthly Magazine of Sense and Science, was published between 1901and1904, edited by Lady Blount. The first organization to use the title ‘Flat Earth society’ was the International Flat Earth Research Society (IFERS), founded by Englishman Samuel Shenton in 1956. Shenton died in 1971, and from 1972 until 2001, The IFERS was headed by Charles Johnson, an American. The belief lacked representation after Johnson’s death in 2001, until the name was reclaimed in 2004 by Daniel Shenton, an American from Virginia now reportedly living in Hong Kong. Members of the Flat Earth Society argue that all photographic evidence of a spherical Earth is faked by NASA and the world’s governments for monetary reasons. Could the photos be faked? Sure. Hollywood’s computer-generated realities can make anything we can imagine look real. Samuel Rowbotham waded into the Old Bedford River in the summer of 1838 and held a telescope just eight inches above the water level to watch a boat with a five-foot mast row slowly away from him. He knew that if surface of the Earth is curved, the water surface would be curved according to the accepted circumference of a spherical earth, and the boat should slowly descend as it moved away from him on the curved surface, until even the top of the mast should be below his line of sight. Rowbotham reported that the entire vessel remained constantly in his view for the full six miles, all the way to Welney Bridge, which would indicate a flat Earth. He repeated this experiment several times, but his claims that the Earth is flat were ignored by the scientists of the day, until, in 1870, one of his supporters, John Hampden offered a wager that he could prove to anyone, by repeating Rowbotham's experiment, that the earth was flat. A famous naturalist and professional surveyor, Alfred Russell Wallace, accepted the wager. Wallace, with surveyor's training and knowledge of basic optics knew that Rowbotham may have made a mistake by setting his telescope too close to the water’s surface allowing the boat to be visible because of atmospheric refraction in the humid air just above the river’s surface. Wallace avoided this by setting his line of sight 13 feet above the water, to avoid the effects of atmospheric refraction. The boat was then seen to be slowly descending below the line of sight as it moved away, because of the curvature of the surface of the Earth. The referees for the wager who held the money involved, declared Wallace the winner and awarded him Hampden’s money, and Hampden promptly sued, claiming that Wallace had cheated. Several versions of the experiment were subsequently carried out by various people, including Lady Blount with various results. Both sides accused the other side of cheating, Hampden wound up in jail for threatening to kill Wallace, and the controversy raged on for years. The public loved the controversy and as a result, Lady Blount and her followers sold a lot of magazines, and the Flat Earth Society was born. Why did Rowbotham devise his experiment in the first place? Galileo’s sun-centered solar system had been validated by astronomers like Johannes Kepler, and Kepler’s three laws of planetary motion were already known 200 years before Rowbotham’s experiment, and in addition, Newton’s, laws generalizing and confirming planetary physics had been published about 100 years before the Bedford River Level experiments. All of this rigorous physics and astronomy required a spherical or nearly spherical Earth. It appears that Rowbotham was motivated by religious belief. In tracing the historical origin of the Flat Earth Society, we’ve uncovered evidence that the understanding that the Earth was shaped like a ball like the other planets preceded the Flat Earth hypothesis by hundreds of years, but was there any simple direct proof? The answer is: Yes, there was, and it was even much, much earlier; at least 2,245 years ago! Greek Librarian, Eratosthenes, Calculates the Diameter of the Earth! Alexandria, Egypt: The Honorable Chief Librarian of the Ancient Library, Eratosthenes, peered into a well here at noon and came up with the diameter and circumference of the Earth! He did it with measurements made during the summer solstice in Alexandria and Syene. Did Eratosthenes come up with it himself, or did the idea that the Earth is a spherical planet go back even farther? Eratosthenes had access to the largest known depository of knowledge in the world at that time. Could it be that he found the information in a book that was already centuries old at that time? We may never know, but somehow he figured out that he could calculate the Earth's circumference. His method is simple, requiring no advanced equipment or mathematics. So we can prove the Earth is a sphere using a simple formula that's over 2,200 years old! He calculated the circumference of the Earth using the following method: It was general knowledge that on the summer solstice, the longest day of the year, at midday, the sun above Syene, Egypt, would be directly overhead. The day of the solstice could be determined by looking into a well, because the sun illuminated the bottom of a vertical well only during the solstice. 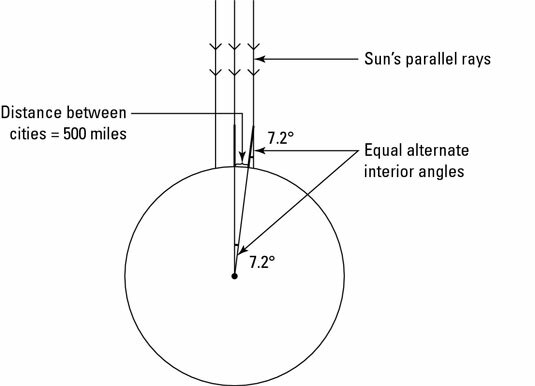 So on the summer solstice, he measured the shadow cast by a vertical pole in Alexandria and saw that at noon the sun missed being directly overhead by about 7.2° angle. The following figure shows how Eratosthenes's earth measurement worked. Eratosthenes divided 360° by 7.2° and got 50, which told him that the distance between Alexandria and Syene (500 miles) was 1/50 of the total distance around the Earth. So he multiplied 500 by 50 and concluded that the Earth's circumference was about 25,000 miles. The distance around the Earth at the equator has been accurately measured as 24,901 miles. You can use Eratosthenes’ method to measure the circumference of the Earth yourself, if you want. You will need to measure, as accurately as you can, the length of the shadows cast by two straight poles that are a few hundred miles north and south of each other at the same time on the same day. You can measure at one location and have a friend measure at the other, or you can travel and make all of the measurements yourself. If you make the measurements at the same time of day on consecutive days, the difference of the angle on consecutive days will be less than the margin of error in the measurements. Make the measurements at local noon. You can do this by looking in the local paper for the time of sunrise and sunset - local noon is half way between these times. Be sure that the pole is vertical. Record both the length of the pole and the length of the shadow. The angle of separation of the two points on the Earth is to 360° as the distance between them is to the circumference of the Earth. If you do this carefully and measure as accurately as you can, your calculation of the Earth’s circumference will be very close to the number Eratosthenes obtained. There are some very flat places on the Earth. Like Kansas. Driving across Kansas and sailing across the ocean have something in common. In both cases, you can only see something on the ocean, or on the plains about 21 miles away. Why is this? Is it because our eyes can only see that far? No, because on a cloudless night, we can see all the way to the moon! Is it because of atmospheric density? No, because we can see the Rocky Mountains as much as 100 miles away, because of their height. We don’t see the town that is only 25 or 30 miles away because it is hidden from straight line sight by the curvature of the Earth. A few years ago, on a Lufthansa flight, I flew from San Francisco California to Frankfurt Germany over the polar route. I left San Francisco about 9:00 PM. It was a clear night and I could see the moon reflected in lakes and streams even from 30,000 plus feet, about six miles high. We went over several states, part of Canada and Nova Scotia, Greenland and Iceland, down over Scotland, and into the heart of Europe. Somewhere after Iceland, the sun came up in the northeast, moved along the horizon for a few hours, and dipped down below the horizon again in the northwest. I cannot explain what I saw if the Earth is a flat disc as hypothesized by the Flat Earth Society. If the Earth is an oblate spheroid, I can explain it. Also, the Earth can’t be a disc with the North Pole in the center and Antarctica as a wall of ice around the southern edge of the disc, because if this were true, sailing or flying around the ice wall would be an extremely long trip, a distance much greater than the distance around the equator, if the Earth is flat. But the continent of Antarctica has been circumnavigated 10 times since 1772, and best estimate of the distance around the continent, is a mere 8,000 miles, much less than the trip around the equator, not the nearly 40,000 miles it should be if the Earth were flat. It is also important to note that the distance around the equator is, within the margin of error, the exact same as the circumference of a spherical Earth calculated by Eratosthenes! The similar opposing wind patterns over the north and south hemispheres, unexplained by a flat disc Earth, also fit very well with a spinning spheroid Earth. I have noticed that many people will believe whatever they want regardless of the facts. Think about politicians, for example. I also know that some people like to take the other side of any idea, however obvious, and argue as if the contrary position is the truth. It is no wonder that there are intelligent people out there who still don’t believe the theory of relativity, when something as obviously goofy as the Flat Earth hypothesis can still gain supporters.